Should You Build Out or Up? Building a new home is an incredibly exciting process. As you discuss your new home construction plans with your architect or general contractor, you want to make sure you account for every detail. 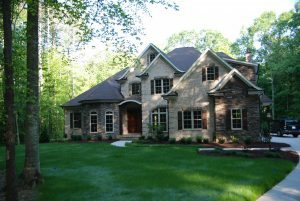 Whether you love to dream about every single detail or you prefer to let the professionals design your new home, consider the pros and cons of building up versus building out. Building out is an appealing option for many homeowners. It’s a natural way to allow for a large, open-floor living space. Another benefit to building out is the lack of a staircase. Stairs are uncomfortable or dangerous for many homeowners. Parents with young children prefer avoiding stairs, and older homeowners are also more comfortable navigating a single-story home. However, a single-story home has a number of disadvantages. First, it takes up more yard space. If your new home construction is in a city or subdivision, you may have a noticeably smaller yard than if you’d built a two-story home with the same square footage. Depending on your foundation type, a single-story home can also be more expensive than a two-story home with the same square footage. A two-story home enjoys many advantages over a single-story option. Many of these advantages depend on your particular location, but it’s typically a more affordable option for any location. If you live in a rural area or have neighbors with single-story homes, a two-story home can provide you with excellent views. Depending on your design choices, a staircase can be a stunning interior feature. Of course, a two-story home requires you to navigate a staircase, which can be difficult or impractical for some homeowners. Consider the pros and cons of building up or building out for your new home construction. Talk to a local professional today to consider which option would be best for your particular building site.